What a beautiful colour ! He looks as though someone clever has doodled on him with a fine felt pen . You just can’t help but love a little Pug! 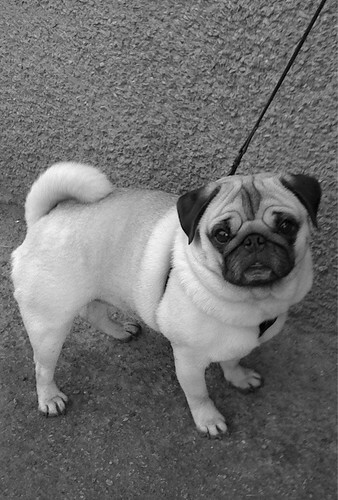 Awww, pugs are my favourite type of dogs 🙂 he/she is beautiful! Sweet, beautiful dogs, your Marco the sweetest. Wishing you and your mum as much peace as Marco’s eyes exude. I was so sorry Wendy, to read about your dear Mother. You showed a picture of her once at your kitchen sink, her back to the camera and I thought that even at that angle she looked like a kind and motherly lady. I know this situation, Wendy. I have been through it many years ago and it is painful. Please be brave dear girl and give all my best wishes to your Mum. Mary. P.S. Glad to hear that ‘the Boy’ Marco is well. Kiss him for me. Mary.